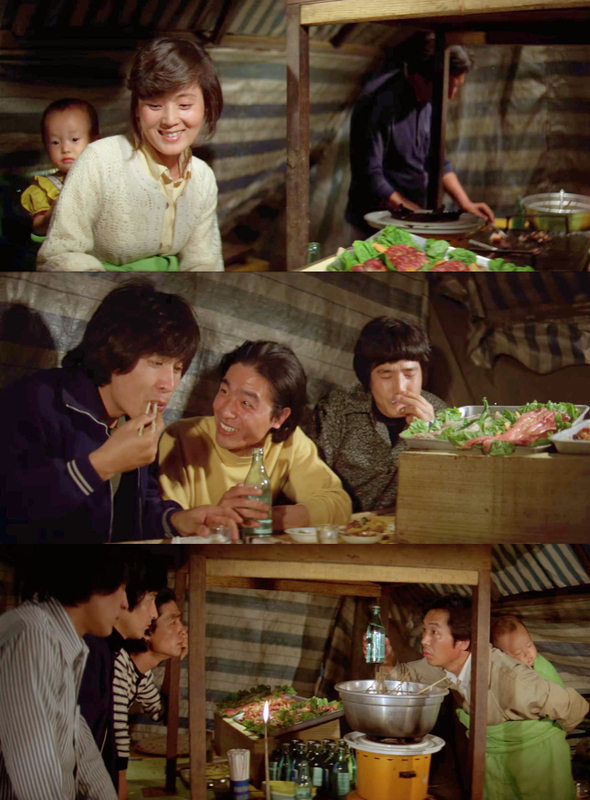 In director Lee Jang-ho’s 1980 film “A Fine, Windy Day,” the pojangmacha is a place where members of Seoul’s growing underclass meet daily to talk about their pains, gains and fantasies over cheap food and soju. 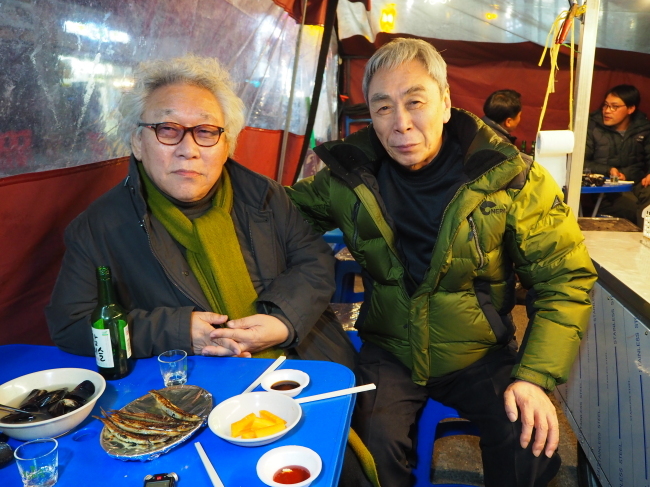 In a country notorious for its die-hard drinking, pojangmacha — meaning “covered wagon” in Korean and referring to a tented outdoor food stall — have been at the center of Korea’s after-work camaraderie. Thirty-seven years have passed since the release of movie that portrayed the country’s desires and changing appearance. Pojangmacha, like many of the film’s scenes, have since faded to a distant memory for many Koreans. In the cramped, damp space the size of a one-room apartment, customers’ conversations mingled, growing louder, even quarrelsome at times, as the evening drew on. Amid the cacophony, the lady owner busily prepared food, haggled with her clients, and occasionally invited in passersby who gazed into her business. Kim described bars and lounges that younger people preferred as pretentious and having too many rules of etiquette. Lying outside legal protection, pojangmacha are generally operated based on a commercial right granted by the government to disadvantaged people, such as the disabled. They are mostly in Gangbuk — the area of Seoul north of the river — and provincial cities nowadays. Kim, in his 70s, said he spent much of his 20s and 30s in the Middle East as a construction worker. He worked in Saudi Arabia for two and a half years, during which he came home once a year. 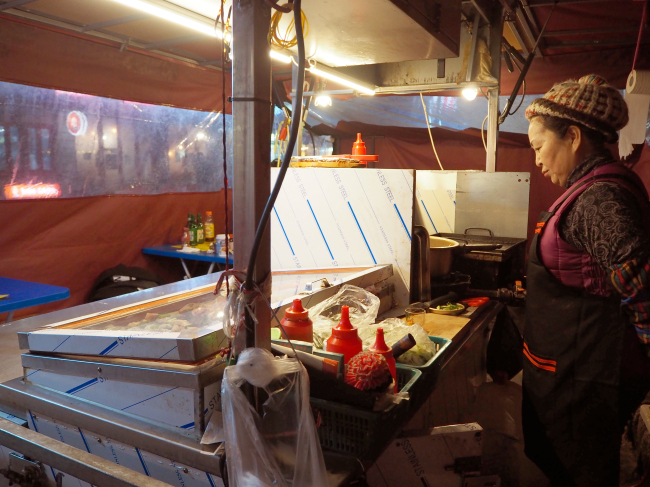 Gong Bo-bae, 62, the owner, said she has been running the pojangmacha for 20 years, ever since her family’s fortune started waning in the wake of the Asian financial crisis of 1997. Her business had continually shrunk over the last five years she said. “Do you know how difficult it is?” she asked, adding that because the pojangmacha is by the roadside, she has to set up the tent and the whole paraphernalia every day when she opens it at 6 p.m., and disassemble it at 5:30 a.m. to be stored at a nearby facility. The peak time is from 8 p.m. through midnight, and peak seasons are spring and autumn, she noted. The menu included grilled sea eel, spicy chicken feet, stir-fried cow innards, blood sausage, grilled saury, sea cucumber and sea squirt — popular dishes cooked using ingredients sourced from a local market. She said water and electricity were provided by the city government. “There is no pleasure or reward in doing this. I just trudge along day to day to survive. I will continue to subsist here as long as my heath allows. With no savings, I have no other alternative for livelihood,” Gong conceded. Kim Jung-duk, chief executive officer of Danji Food and Beverage, a restaurant franchise consulting firm, told The Korea Herald that the demise of pojangmacha had been accelerated by the increasing use of credit cards. Another reason for the declining popularity is competition from franchises offering similar menus in permanent locations, Kim said. 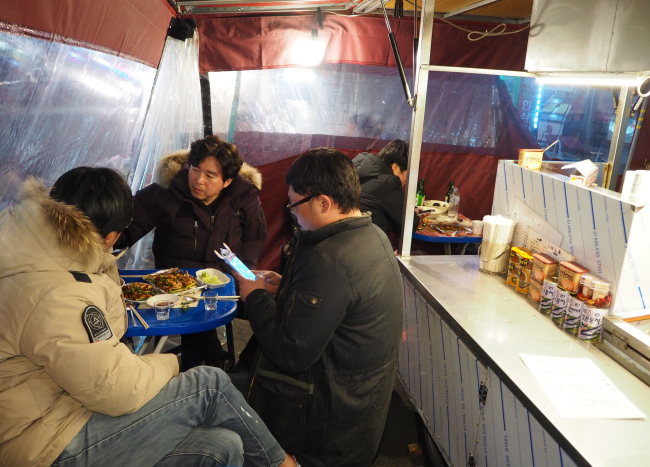 He mentioned countrywide chains such as Hanshin Pocha, which replicates the feel of a pojangmacha at large outlets. Also the gentrification of tastes, particularly among the young with no attachment to the venue, played a role. 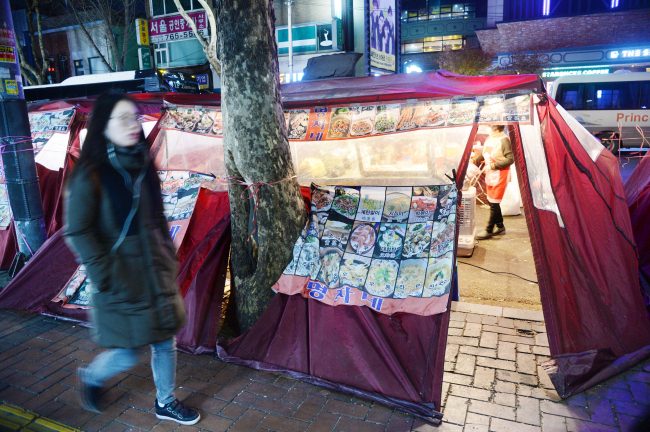 “The commercial space for pojangmacha will get increasingly smaller,” he said, suggesting they could be revived by commercializing them at permanent locations like in Yeosu, South Jeolla Province, where it is a harbor-front attraction.